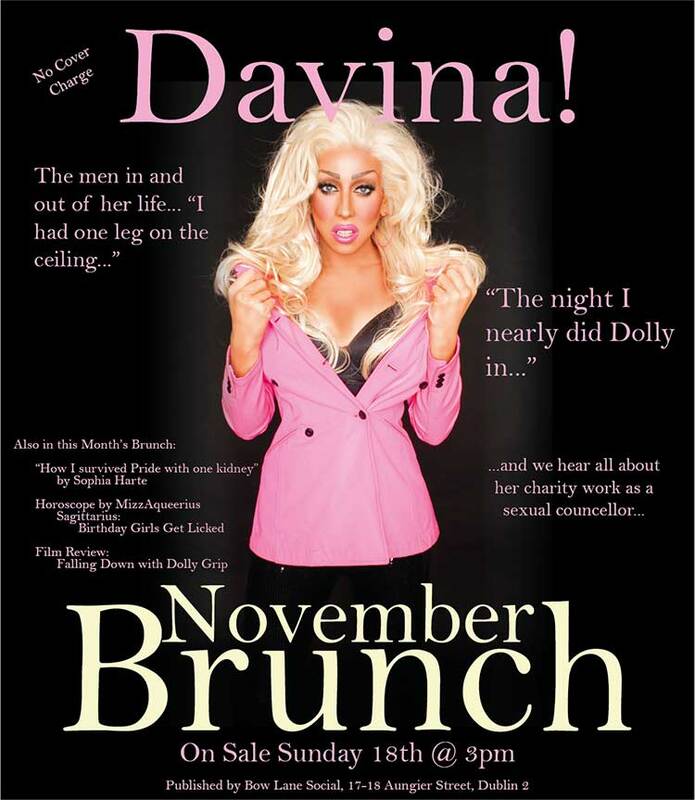 The November edition of Drag Brunch is out! This month our favourite Fashion Icon / Celeb / DJ / Working Mum / Ex-Celebrant Davina Devine gives us the low down on her hoes and hes and why she spared Dolly Grip from certain death by chocolate. Also in the November edition of Drag Brunch: Health advice from Sophia Harte delivered through interpretative gymnastics and MizzAqueerius is on hand to lick the faces of all the Birthday Girls. November Drag Brunch is on at Bow Lane on Sunday 18th and starts at 3pm. You can book a table below and they are available from 2:15pm to 2:45pm and the event goes on until 6pm. Premium tables are those nearest the performance area and are limited in number, they go fast! Non-premium tables may not have a view but you are welcome to stand up and watch the show which usually starts at about 4pm or when the drags can bother their arses. From 4pm there is our #MoreFromFour offer of 2 for €12 on all our listed cocktails. View the Brunch menu here. NOTE: Drag Brunch is not for little ears or little minds, don’t bring children, they won’t be let in!!! Book your copy online now!